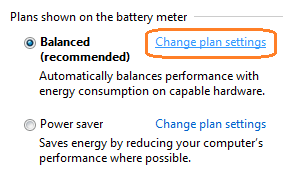 A power plan is a group of settings that manages your computer power usages. You can use the feature to customize the amount of power being use, performance increases or balance them. Anyway, what if your computer still sleeps even if you set that into the Never feature? Let's go the the power options and see other customization that can be use. Quick tip: if you can't find the settings at your taskbar, type "powercfg.cpl" to your Run window or command prompt. To customize the Balanced power plan, In which, as shown it automatically balances performance with energy consumption on capable hardware. 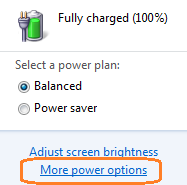 Double-check if the computer is set not to sleep at plugin and go to "advanced power option" to see other features of the plan. At the advanced options, go to the hard disk settings and set it to 0 to reflect Never. That's it! Hope this helps! There are so many ways to gather information about your computer. One of these is using Windows Management Instrumentation (WMI). Here's a quick tip to list all available drives using the tool called wmic. Command Prompt is a feature of Microsoft Windows that processes any tasks on your computer without using the graphical windows interface. By just typing any command, you can perform some administrative tasks typically only used by advanced users. How can we get the list of commands that we can use at the command prompt? - To view the list of common commands as shown below, type help at the command prompt, and then press Enter. ASSOC Displays or modifies file extension associations. AT Schedules commands and programs to run on a computer. ATTRIB Displays or changes file attributes. BREAK Sets or clears extended CTRL+C checking. CACLS Displays or modifies access control lists (ACLs) of files. CALL Calls one batch program from another. CD Displays the name of or changes the current directory. CHCP Displays or sets the active code page number. CHDIR Displays the name of or changes the current directory. CHKDSK Checks a disk and displays a status report. CHKNTFS Displays or modifies the checking of disk at boot time. CMD Starts a new instance of the Windows command interpreter. COLOR Sets the default console foreground and background colors. COMP Compares the contents of two files or sets of files. COMPACT Displays or alters the compression of files on NTFS partitions. CONVERT Converts FAT volumes to NTFS. You cannot convert the current drive. COPY Copies one or more files to another location. DATE Displays or sets the date. DIR Displays a list of files and subdirectories in a directory. DOSKEY Edits command lines, recalls Windows commands, and creates macros. ECHO Displays messages, or turns command echoing on or off. ERASE Deletes one or more files. EXIT Quits the CMD.EXE program (command interpreter). FC Compares two files or sets of files, and displays the differences between them. FIND Searches for a text string in a file or files. FINDSTR Searches for strings in files. FOR Runs a specified command for each file in a set of files. FORMAT Formats a disk for use with Windows. GOTO Directs the Windows command interpreter to a labeled line in a batch program. GRAFTABL Enables Windows to display an extended character set in graphics mode. HELP Provides Help information for Windows commands. IF Performs conditional processing in batch programs. LABEL Creates, changes, or deletes the volume label of a disk. MODE Configures a system device. MORE Displays output one screen at a time. MOVE Moves one or more files from one directory to another directory. PATH Displays or sets a search path for executable files. PAUSE Suspends processing of a batch file and displays a message. POPD Restores the previous value of the current directory saved by PUSHD. PRINT Prints a text file. PROMPT Changes the Windows command prompt. PUSHD Saves the current directory then changes it. RECOVER Recovers readable information from a bad or defective disk. REM Records comments (remarks) in batch files or CONFIG.SYS. REN Renames a file or files. RENAME Renames a file or files. SET Displays, sets, or removes Windows environment variables. SHIFT Shifts the position of replaceable parameters in batch files. START Starts a separate window to run a specified program or command. SUBST Associates a path with a drive letter. TIME Displays or sets the system time. TITLE Sets the window title for a CMD.EXE session. TREE Graphically displays the directory structure of a drive or path. TYPE Displays the contents of a text file. VER Displays the Windows version. VERIFY Tells Windows whether to verify that your files are written correctly to a disk. VOL Displays a disk volume label and serial number. XCOPY Copies files and directory trees. To view more information about each of these commands, type help commandname, where commandname is the name of the command you want more information about. How do I run a command with elevated privileges? - To run any command at Command Prompt as an administrator, you must make sure that cmd.exe is running with privileges. Click the Start button, In the search box, type command prompt. In the list of results, right-click Command Prompt, and then click Run as administrator. When you open a program, Windows allocates a path that can be use by temporary files so that it can be launch and displayed more quickly if you open it again later. - This location can be find by typing %temp% on Start Search. Also, the location suggests that temporary files inside the folder are local. It means for the login user. - the location means that temporary files is use in any part of the system itself. - This location is also local but can be found on older version of windows. Websites are saved in your Temporary Internet Files folder the first time you view them in your internet browser. This acts like a memory and speeds up the display of web pages you frequently visit because Internet Explorer can open them from your hard disk instead of from the Internet. Delete All "Also delete files and settings stored by add-ons"
Overall, The following list of temporary files hard disk location can help you view and delete these files later, and change the amount of disk space that these files use on your computer later. To save more space, Disk Cleanup finds and cleans by freeing more space at temporary files on your computer. 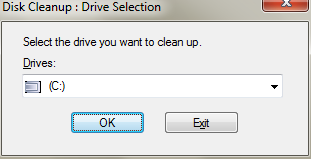 In windows, If you have more than one partition on your computer, you will be asked to choose which drive you want to be clean. Here's a quick tip on how to access the tool using the command line. Overall, Disk cleanup is a very nice tool for cleaning up your computer, getting more resources instead of wasting them. The methods above is a nice to have tip for administrators who wants to create shortcuts for specific tasks for maintenance of computers. Having trouble accessing windows programs like folder options, registry, msconfig and others? This tip will help you work around on some annoyances that we encounter when our computer is very slow and troubled with viruses. So, if your having trouble accessing the part of windows, try the feature above by going to your Run Window or command prompt.